The WooCommerce Stock Synchronization Plugin allows you to synchronize the stock values of the same products across multiple WooCommerce shops. Only stock levels are synchronized, not the products themselves. This guide contains all the necessary information to get the plugin up and running quickly. IMPORTANT: All products you want to synchronize, must share the same SKU. If you use product variations, make sure all variations have their own unique SKU. NOTICE: The WooCommerce Stock Synchronization plugin only syncs the stock. We have no plans to add support for syncing other product data. 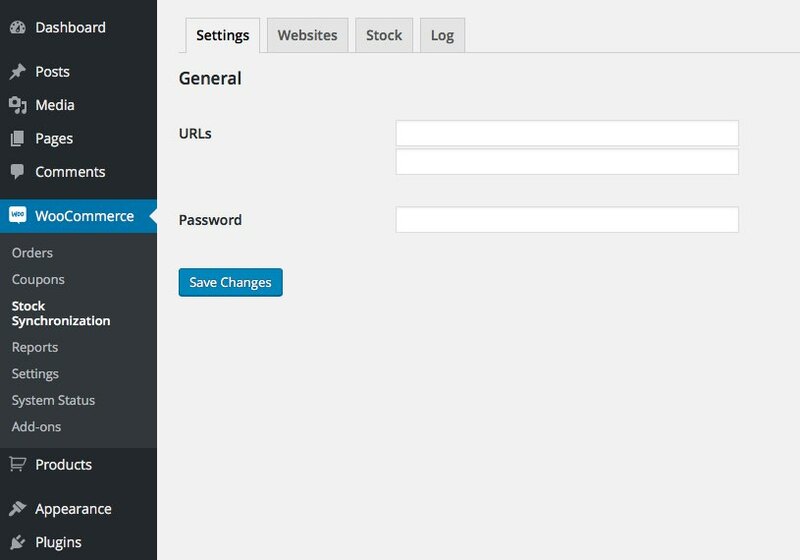 Before you can synchronize stock levels with the WooCommerce Stock Synchronization plugin, you first need to set some required information. It is in those fields that we must configure only 2 things before the plugin starts to work: URLs and a shared password. URLs indicate the locations of your WordPress sites you wish to synchronize stock of WordPress products to. When you press Save Changes, additional URL fields will be added. Continue adding sites as needed, at least one URL is required to be able to synchronize stock levels to an other store. This is a secure password so that the plugin only accepts authorized stock modifications. We recommend a strong password, which you need to configure on each site you’re using the WooCommerce Stock Synchronization plugin on (you need to enter the same password in each store). Once you’ve entered the URL’s and have set the password, clicking Save Changes will save those details and the plugin will be ready to use. There are 3 usages of the WooCommerce Stock Synchronization plugin. Stock levels are automatically synchronized when you edit a product and the changes are saved. Also, when the stock increases or decreases because an order was placed or cancelled, this will get synchronized to all the stores you’ve added. The Push Stock button on the Stock tab will retrieve stock values for ALL products on the site and send these to every site listed in the URLs of the settings page. Last modified: 5 October 2017.